Crash Test is the new scratch night in Aberystwyth offering a chance for writers, performers, directors, artists to present work in development to a supportive audience. All forms of performance are welcome the only restriction is that it has to involve words. Previous scratch nights have included comedy sketches, performance cabaret, stand-up comedy, short plays, short film scripts, storytelling, play excerpts. We have presented a debut stand-up comedy performance from Julie Grady-Thomas, the first ever public performance of a play by new writer James Baker and a play excerpt from local community company Louche Theatre. 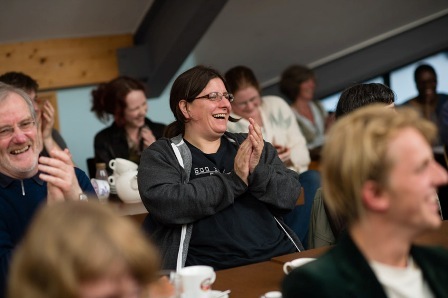 The new scratch night is produced by Scriptography Productions and offers a chance for writers from the Aberystwyth Art Centre’s Writing for Performance group to scratch work in an informal and friendly environment. It is also striving to represent the diversity of the performance landscape in Aberystwyth and welcomes participation from all performance groups, associations and individuals.